The roof of your house is the most important element. A roof is something which is responsible for giving you protection from all the external factors. Your roof plays a very important role in protecting you from all the adverse calamities and all the climatic conditions prevailing in the area you live in. a roof is also a one-time investment. You must be very careful when you are getting your roof made. You cannot go over the roof again and again to see if it is ok or it is working fine like you can do for other parts and furniture of your house. A good option to keep your roof up to date is by power washing the shingles of your roof. Excessive dirt and leaves get accumulated on the roof, which makes it heavy. In the rainy season, water can also seep-in in through the roof. 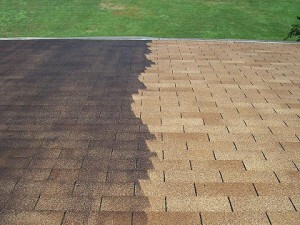 Power washing your roof shingles will clean the shingles. It will give your house an overall attractive and clean look. You will get rid of all the dirt and unwanted stuff from over your head. Now the question is how to powerwash a roof. We have the perfect solution in steps for you. First of all there may be a lot of stuff present on your roof. It can be dirt, debris, algae, black stains, moss, etc. You can remove all the debris with the help of a simple broom or brush. Power washing is mostly required to remove all the algae and black stains that have started appearing on the roof. You can also apply pressure roof cleaning methods to get rid of all the dirt and debris on your roof shingles, irrespective of the material they are made up of. Asphalt shingles are other types of shingles that are used in the roof. Cleaning them can take a lot of time and effort. But it is necessary to avoid any other problem arising because of a poor quality roof. Asphalt shingles are often filled up with moss. Cleaning such kind of dirt requires power wash roof moss cleaning or pressure roof cleaning. The most important cause of concern is how to pressure clean a roof. How exactly the power washing process should be done? Here are a few steps which will help you satisfy your cause of concern. Get in all the safety gears, like gloves and non-slippery foot wear and wear them. Get on the highest point of your roof. Now start your pipe, you have to be careful where the water stream is getting applies. Since the pressure of the stream is very high, if you apply it within the spaces between the shingles, it will cause the shingles to move farther from each other creating an undesired gap between the two shingles. You must not let this happen. Let the pressure stream on the shingle and not between the gaps. Be careful to wash off the whole roof by this method. The best way to clean a roof is either manually. Apart from cleaning your roof manually, you can use the power washing method also. We have discussed the methods to clean your roof shingles with the help of manual and power washing techniques both. Now you also know how to pressure clean a roof. The life of the roof shingles increases if you clean and maintain them properly as per professionally guided steps.